You will earn 1,542 Reward Points. Earn 1 reward point for every 1 dollar spent. Built-in bun box saves space, reduces cost and provides sanitary storage of buns and clear door improves visibility of buns. Unique “stadium seating” rollers slanted at 3° to 5° for the best presentation of your products increasing sales and impulse purchases. Seal-Max superior heavy-duty roller bearing and seal combination provides smoother operation, longer life, low maintenance and grease-free internal compartments. Exclusive Duratec coated non-stick rollers, the best non-stick high performance coating for today’s high volume operations. Duratec rollers meet the demands for improved durability, cleanability and feature superior grip for improved rollability of today’s new Roller Grill snack foods. Star Roller Grills, Bun Boxes and Sneeze Guards combine to make the leading “Hot Dog Center” in the industry. These units, available in a variety of styles and sizes, are perfect for use in snack bars, convenience stores, recreational facilities, stadiums, and virtually any venue where fast food is sold. Constructed of heavy gauge stainless steel with options of Duratec or Chrome rollers with incoloy sheath elements. Infinite temperature controls for accurate cooking and holding from low to high. Heavy-duty motor provides 360 rotation of rollers with stadium seating. Units ship standard with a 6’ cord and plug. Sneeze guards are formed polycarbonate and meet health department requirements. Roller Grill is constructed of all stainless steel and utilizes Duratec non-stick coated rollers or chrome rollers and tubular incoloy sheath elements. Elements are mounted in a fixed and floating system allowing for lateral expansion to minimize warping. Infinite temperature controls provide accurate cooking and holding from low to high. Unit has a heavy-duty motor and provides 360º rotation of rollers. The rollers are arranged in stadium seating with a slope of 3º to 5º, and a graphic door provides better merchandising. 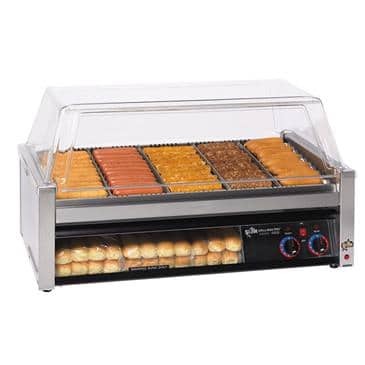 The Roller Grill incorporates Seal-Max®, Star’s exclusive seal and bearing combination. Units have a pilot light and 6’ lead in cord with NEMA plug. ULSanitation to NSF Std. #4 approved and UL listed. Printed in the U.S.A. Star Grill-Max grills patent #6,393,971 & #6,782,802. Printed in U.S.A.